Calatrava designed the WTC Transportation Hub in New York City at the rebuilt World Trade Center at the site of the September 11 attacks in 2001. The new station connects the regional trains of the new PATH with the subway and other local transportation, and also has a large retail mall, replacing commercial space destroyed in the attack. The above-ground “oculus” of the station, made of glass and steel, is oval-shaped, and is 35 meters long and 29 meters high. According to Calatrava, it resembles “a bird flying from the hands of a child”.The “Wings” of the above-ground structure were originally designed to move upward to a maximum height of 51 meters to form a double screen 51 meters high, but this feature had to be dropped to meet new security standards. The main hall of the station is ten meters underground, and the tracks of the PATH system on another level eight meters below. The underground station was originally designed so that its roof would open entirely in good weather, but this feature also had to be dropped due to its cost and space limitations. *The following article appears in the March 9, 2015 issue of New York Magazine. Rust? Calatrava couldn’t believe the naysayers could be so ignorant. “This is not yet painted!” he said as we stood across from the construction site. Calatrava expects the building — and its architect — to be vindicated once the public is able to experience it in full. For now, though, he was outside in the cold, just another sidewalk gawker in a soft suede jacket. The Port Authority of New York and New Jersey, which will run the PATH train out of the station, was in a defensive crouch after a year of scandals, subpoenas, and exposés — some of them related to the hub and its budget. Calatrava’s relationship with his client was strained. (A Port Authority spokeswoman refused to authorize a photograph of the architect inside his own building.) In light of the tension, we had planned to keep our stroll confined to the World Trade Center’s public areas. But Calatrava is a temperamental artist, and he bridles at limitations. “Let’s go,” he said. We walked briskly to a guard booth at the south end of the plaza. Richard Diamond, Calatrava’s man on-site — “He’s God,” Diamond explained, “and I’m king” — invoked the architect’s name. IDs were presented and hard hats appeared. Once we cleared security, we followed Diamond through a plywood door spray-painted KEEP CLOSED, descended a set of raw-concrete stairs, uncertainly navigated temporary passages, and came to an opening covered by a white tarp. Calatrava pulled the curtain aside like a showman, raising his bushy black eyebrows. Light filtered in through the exterior ribs, which come almost together in an arc 160 feet above the floor. Up at ground level, a pair of observation decks faced one another across the vaulted space. A floor below, the walkway where we were standing will one day be ringed with shops — Calatrava pointed out a space he said was reserved for an enormous Apple Store — and passages offering access to 11 subway lines. At the east end, there will be a new glassed-in stop on the 1 train. The floor of the oculus leads to a grand staircase and yet another enormous space, the PATH Hall, as well as train platforms and shopping corridors, all clad in marble to Calatrava’s precise specifications. No recent addition to the cityscape has aspired to combine public utility and aesthetic daring to the same degree. Craig Dykers, whose architecture firm Snøhetta designed the adjacent 9/11 Memorial Museum Pavilion, says the hub will “open the site in a way that people don’t truly comprehend.” While much of what’s been built at the World Trade Center is sealed off as fortified office buildings or dedicated to commemorating deaths, Calatrava’s subterranean expanse is supposed to be animated by the bustle of everyday life. After years of delays, the hub and its 350,000 square feet of retail space are scheduled to begin opening in stages this year. Even if so, once you’re inside, it’s a magnificent boondoggle. “We wanted to give the sense that it is not the tower that makes the place,” Calatrava said, referring to One World Trade Center, “but the station.” He has insisted on “creating a unity,” leaving his personal mark on details as small as the door handles. As we walked through, Diamond noted imperfections — an uncaulked gap here, a discolored marble tile there — and barked out orders to contractors. It is fitting that the Port Authority — a two-headed toll-taking giant with a poor sense of political timing—has chosen this moment to express buyer’s remorse. For it is only now, nearly 15 years in, that the World Trade Center redevelopment actually, finally, seems to be coming together in all its compromised glory. Condé Nast moved into One World Trade not long ago. Developer Larry Silverstein has finished one skyscraper, Four World Trade, and is constructing its neighbor, Three World Trade. Even in the wintertime, tourists congregate around the twin voids of the 9/11 memorial, leaving flowers in the etched names of the dead. But on a warm day, the leaves are green on landscape architect Peter Walker’s plaza, you might almost be able to forget the redevelopment’s tragic origin. “Immediately after 9/11, it was really difficult for most folks to grasp what the possibilities were,” says Ric Clark, CEO of Brookfield Property Partners. His company’s adjacent complex—formerly the World Financial Center, now called Brookfield Place—is undergoing a $300 million renovation, bringing in new restaurants and stores to suit changing demographics. One of the initial assumptions of the rebuilding — that its aim was to rescue the historic Financial District — has been pleasantly confounded, as lower Manhattan (and its lower rents) has proved attractive to tenants from creative industries. At Brookfield Place, Time Inc. is moving into space once occupied by Merrill Lynch, and the advertising firm GroupM will be leasing a major portion of Three World Trade. When it is completed and fully leased — still a distant prospect — some 100,000 people will work in the World Trade Center and its immediate surroundings. The tangible effects of the billions in public investment can be seen across the Hudson River, in Jersey City, where 24,000 new residential units are currently approved or under construction along the PATH train’s route. The hub is meant to be more than a destination for commuters, though. Westfield, an Australian mall operator, has agreed to pay $1.4 billion for the hub’s retail space and has signed up tenants like Michael Kors and Eataly. The station’s underground corridors are meant to act as the whole area’s circulatory system, creating a link running from Battery Park City to Broadway and the recently refurbished Fulton Center subway station, which serves 300,000 riders each day. “A railway station is something that can generate a city,” Calatrava told me when I first met him last year at his studio, which is in one of three adjoining townhouses he owns on Park Avenue. Although business at his 120-person firm still seems to be brisk — in addition to projects in Brazil, Switzerland, and Qatar, he recently broke ground on a second building at the World Trade Center, a replacement for a destroyed Greek Orthodox church — he was in a counter­punching mood. He knew he was about to receive another roundhouse from the Times: an investigation examining how the PATH station, originally budgeted for $2.2 billion, had doubled in cost. He was still smarting from a 2013 article, mainly about his work in Europe, that described “an unusually long list of projects marred by cost overruns, delays and litigation,” like an arts center in his native Spain where the budget quadrupled and a mosaic façade ultimately had to be taken down because of faulty tiles. That idea — a soaring response to the September 11 attacks — was initially irresistible. Two powerful currents came together to whisk the project forward: the heightened emotions of the time, and the unique internal political culture of the Port Authority. The PA is a state unto itself, financed by a torrent of revenues from bridges, tunnels, airports, and other infrastructure. Its leadership has traditionally been divided evenly between appointees of the governors of New York and New Jersey, making it prone to political factionalism and meddling. (The recent scandal surrounding New Jersey governor Chris Christie and the George Washington Bridge is just a particularly piquant instance.) But the authority’s political appointees are vastly outnumbered by its permanent civil servants. They built the original Twin Towers, and when the buildings collapsed they lost 84 colleagues. Calatrava seems to have figured out early, though, that the ultimate power over the redevelopment would not reside with the public, the newspapers, or the master planner. Libeskind’s influence receded after the initial planning stages, and the Port Authority reasserted control. The PATH station became a pet project of the New Jersey faction on the board, and Calatrava gave its members special attention. “He seduced them,” says a former PA official. One New Jersey appointee, a professional engineer named Anthony Sartor, accompanied Calatrava on a tour of his projects in Europe, along with Anthony Cracchiolo, a PA executive overseeing the rebuilding. With the early support of both the board and the engineers, Calatrava had a first-mover’s advantage. To preserve his spacious interior, his plan distributed crucial but cumbersome elements like air vents to other parts of the site. Officially, Calatrava is working as a “subconsultant” to a pair of heavyweight engineering firms, one of which, STV, has very strong ties to the Port Authority. (Cracchiolo subsequently went to work there, as did Robert Davidson, the PA’s powerful chief architect at the time the contract was signed.) The Port Authority has paid the venture $413 million. An STV spokeswoman confirms that Calatrava’s firm has a 20 percent share of the contract, which indicates he has made around $83 million to date. While it is difficult to feel much pity for an architect whose firm has made $83 million on a single project, it is fair to say that Calatrava does not deserve all — or even most — of the blame for the building’s price. The oculus draws the eye and the barbs, but it accounted for only $319 million of the original budget, while elements like mechanical systems and foundational work made up the difference. It is the hidden costs, buried in the corridors that underpin the entire site, that have truly ballooned. In 2010, a federal monitor found that the project had absorbed $1.2 billion in shared infrastructure costs, only some of which was to be reimbursed. But the hub project wasn’t just a convenient catchall. The Port Authority also treated it like a shrine: an institutional symbol in the form of an engineering solution. 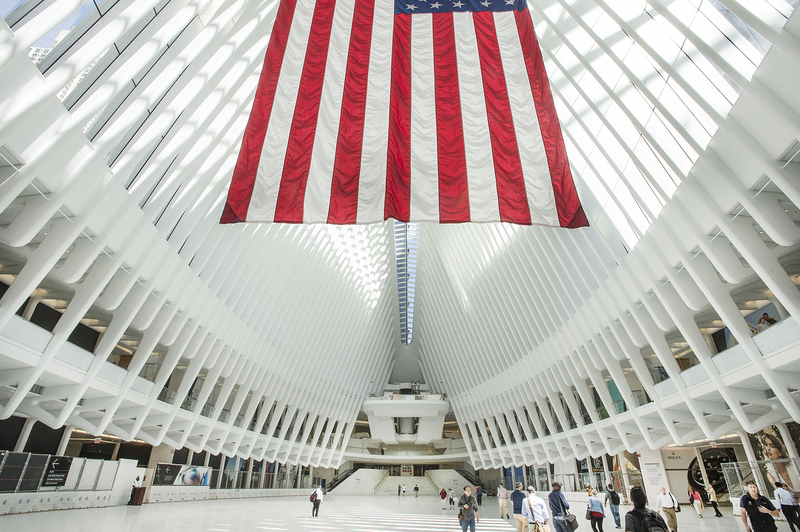 “It’s the most architecturally complex structure ever built by humankind,” said Steven Plate, the PA’s director of construction at the World Trade Center. “But it’s a piece of art.” Plate met me one weekday at the site to offer an update on the progress, which was everywhere in evidence on a winter lunch hour. As we walked through the first portion of the station to an open, white-bathed corridor beneath West Street — it brings to mind the set of a Stanley Kubrick film — well-dressed young Condé Nast employees were heading up the escalators to Brookfield Place’s restaurants. Port Authority workers with squeegees were stationed at strategic points, standing ready to buff. (White marble is not the most practical material for heavily trafficked corridors and train platforms, and some skeptics — pointing to the problematic Calatrava buildings elsewhere — wonder whether maintenance may prove to be an ongoing drain.) At the top of the escalators, we took in an impressive view of Calatrava’s work. “I think we are even more beautiful and more functional than Grand Central station,” Plate said. Though he is a civil engineer, he is no political neophyte — he used to be the mayor of Glen Ridge, New Jersey — and when he escorted me into the areas still under construction, he seemed intent on sending a calculated message: This isn’t our building’s fault. 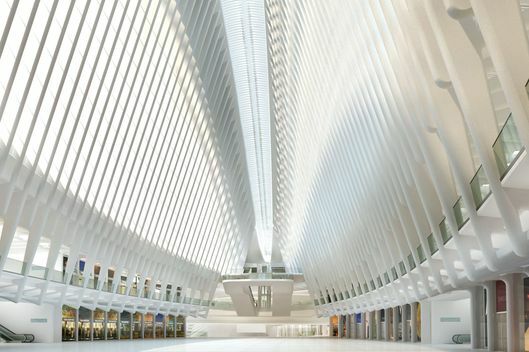 Standing beneath the undulating white ceiling of the PATH Hall, the entry to the train platforms off the oculus, Plate noted that a decree that construction of the memorial plaza be finished for the tenth anniversary of September 11 caused the station to be constructed from the roof down. “It was counterintuitive to how you usually build buildings,” he said. When we heard the rumble of the 1 train, Plate explained how a suspension system was necessary to keep it running to South Ferry for Staten Island commuters. That reportedly cost at least $355 million, several times what was originally estimated. Three days after the memo was written, Spitzer was implicated in a prostitution case and resigned; Calatrava dodged the threat. Throughout the construction process, though, he has had to fight to protect his building from what he saw as interference. A new executive director, Chris Ward, arrived with a mandate to reassess costs and speed the 9/11 memorial’s completion, which would require Calatrava to accept some structural compromises. When he called a showdown meeting at Calatrava’s townhouse, however, two sources told me that Sartor, the chairman of the board’s World Trade Center redevelopment committee, arrived to defend the architect, sitting on his side of the table. Calatrava made a few concessions but was able to preserve his architectural concept. The Port Authority scrapped his idea of allowing the oculus’s wings to retract; instead, there will now be a much more modest skylight. The structure became stockier and spikier — arguably more Jurassic in appearance — to strengthen it against bomb blasts. He allowed four columns to obstruct his interior space. After vociferous argument with the designers of the memorial and its board chairman, Michael Bloomberg, Calatrava gave up on the idea of having natural light shine through glass set in the plaza into the PATH Hall below, because it interfered with the mayor’s priority: planting trees. “You have to live with the necessities of other people,” Calatrava told me, saying that he’s now reconciled to the foliage. Calatrava says he collaborated closely with the Port Authority’s engineers on all the changes. “They’ve never complained,” he said. “They are very happy with me.” In recent years, however, the high-level politics have turned against him. His friends in New Jersey have faced a cascade of corruption investigations since Chris Christie’s bridge scandal. Sartor resigned last year, soon after it emerged that the Manhattan district attorney had subpoenaed records related to the World Trade Center redevelopment. In 2008, the New York Observer reported that even as Sartor was defending the PATH project, the engineering firm that bears his name was exploring a sale to Calatrava’s partner, STV. Sartor says he didn’t have an ownership interest in the firm at the time, and that his resignation was family related. (The DA’s office declined to comment on its investigation.) Calatrava suggested I interview Sartor about the PATH project, but through a PR firm, he declined further comment. Cuomo’s executive-director appointee, Foye, has tried to find cost savings. 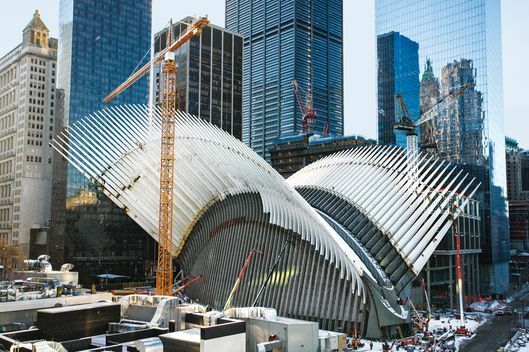 The PA recently shifted the completion of the 1-train station inside the oculus, and at least $100 million of expense, to the MTA, which says it will build to its own specifications, not Calatrava’s. But it’s too late for the kind of thoroughgoing bowdlerization that other parts of the redevelopment — most notably One World Trade — were forced to endure. Whatever you think of the PATH station, it won’t end up looking banal. Form runs into danger when it fails to follow economic function. The current temporary World Trade Center PATH station serves 44,000 riders each weekday, one-fifth the number of commuters who pass through Grand Central. While the Port Authority predicts use will increase, the station will have only five platforms, leading to a pair of ancient tunnels beneath the Hudson and just seven stations in New Jersey. Some urban planners advocate adding rail capacity to the station, but in the current fiscal climate, the notion of digging new tunnels seems fanciful. (And addressing the deteriorating tubes to Penn Station would seem a higher priority.) The PATH needs upgrades to basic hardware like signals. But with money in short supply, the PA has put off investing in many infrastructure projects, while raising tolls to please bond investors. Recently, it delayed a $3.6 billion renovation of La Guardia airport. Calatrava had saved one view for last. We walked around the side of the oculus and gingerly climbed down an ice-covered concrete slope to one of the observation decks. As we stood at an orange mesh barrier, the ribs of his structure arched before us like the rafters of a church ceiling. The welders were still working, the sparks from their torches falling faintly into the chasm below. Through the steel, you could glimpse the memorial plaza. The new One World Trade filled the roof’s central gap. The skyscraper, hardly beautiful when standing alone, looked perfect in composition. The sun glinted off the triangular element of its façade, pointing downward like an arrow toward the westbound trains.